Tha mi gu math excited an-diugh oir tha an turas mòr agam gu Èirinn a Tuath gu bhith a’ tòiseachadh a-màireach. Tha mi a’ dol a dhol air nas urrainn dhomh de thrèanaichean – gu Latharna, Port an Dúnain, Beannchar agus Cúl Raithin – agus fiù’s gu Doire is Port Rois ach deagh sheansa gum bi e dorcha mus bi mi ann. Ged a bha mi ann an Èirinn iomadh turas roimhe, cha robh mi riamh air trèana san dùthaich. Cha b’ urrainn dhomh mapa den lìonra a lorg sa Ghaeilge is mar sin rinn mi fear mi fhèin! 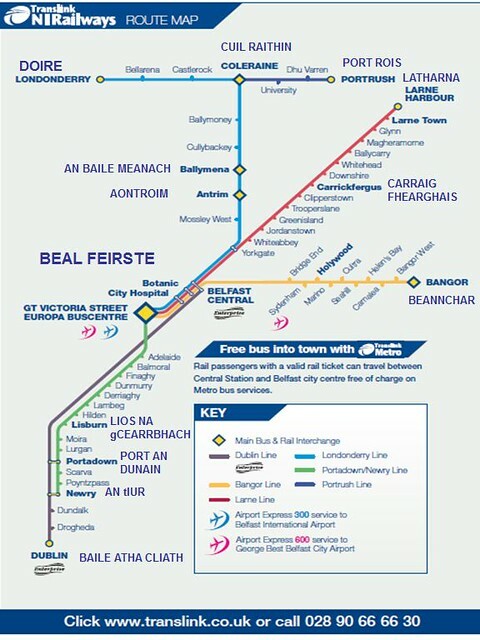 Tha bileag aig Translink, a tha a’ ruith nam busaichean is trèanaichean ann an Èireann a Tuath sa Ghaeilge. Gu mì-fhortanach, ge-tà, tha na h-ainmean-àite is ainmean loidhne agus na rudan cudromach uile sa Bheurla a-mhàin. Chaidh seo a phostadh ann an Gàidhlig agus a thagadh Beal Feirste, Eire, Eirinn, Eirinn a Tuath, Gaeilge, NIR, Northern Ireland Ralways, Translink, Tuaisceart Eireann. Dèan comharra-lìn dhen bhuan-cheangal.